The Cubs enter the 2012-13 offseason with multiple needs, but their pitching staff requires the most attention at this point. Sometimes the second offseason under a new front office can be the first 'normal' winter for a team's baseball operations department. A year ago, in the first offseason under Theo Epstein and Jed Hoyer, the Cubs had to conduct a managerial search, fill out their front office and create a plan for player development. Now, as the Cubs begin their second winter led by Epstein and Hoyer, team executives can focus on their primary task: turning a 101-loss team into a contender and, eventually, bringing that elusive World Series title to the North Side of Chicago. The Cubs spent in excess of $100MM on payroll in each of the past five seasons, so we know the resources are there. Yet to this point, they've committed just $42MM to next year's team, not accounting for arbitration eligible players. That should provide lots of flexibility for Cubs executives, but if last offseason provides any indication, they won't spend for the sake of spending. Instead, the Cubs figure to complete short-term free agent contracts and trades. The Cubs could start by dealing one of their most experienced players. Alfonso Soriano had a good year in 2012, posting .262/.322/.499 batting line and hitting 32 home runs (reaching the 100 RBI-threshold won't hurt his value, either). Though Soriano has made it clear he'd consider waiving his no-trade rights, president of baseball operations Theo Epstein has said he won't deal the 36-year-old unless the Cubs get something of value in return. It's hard to envision Soriano's trade value rising much from here, so if the Cubs intend to create room for younger players and free up some salary, it's now time to make a move. The Cubs will also need a contingency plan for center field. Just about half of Brett Jackson's at bats (59 of 120) ended in strikeouts this year, an indication that he won't make enough contact to maintain a respectable on-base average. He has some power, plays a premium position and can draw walks, but his contact skills create legitimate questions about the likelihood that he'll realize the potential that placed him on many top prospect lists earlier in his career. Between a possible trade for Soriano and the need for a legitimate option behind Jackson, the Cubs could be in the market for outfielders this offseason. They could wait on a deep class of free agent outfielders or contact teams like the Diamondbacks and Twins, who have enviable outfield depth. If the Cubs retain Luis Valbuena they'll be set at all four infield positions, with Starlin Castro, Darwin Barney and Anthony Rizzo occupying the three other spots. The Cubs could look to improve their catching depth following a season in which Chicago catchers placed 28th of the 30 MLB teams in OPS (.616). The free agent market seems relatively strong at catcher this year, and the Cubs could call teams such as the Blue Jays about possible trades. The Cubs have a mid-sized group of arbitration eligible players that includes a number of non-tender candidates. Chris Volstad figures to be cut loose following a poor season; Ian Stewart's wrist issues place him in uncertain territory; Manny Corpas' chances of returning seem slim. Valbuena, the team's fourth non-tender candidate, has earned praise from his manager, an indication he could start the 2013 season as the Cubs' third baseman. Still, management might prefer to have options other than Valbuena and 23-year-old prospect Josh Vitters. 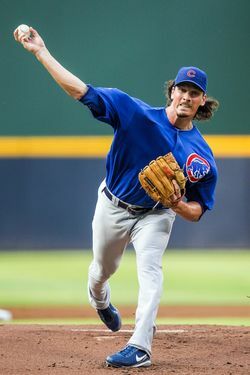 Jeff Samardzija has emerged as an extension candidate following his breakout season — an unexpected ascent that represented one of the primary positives of the Cubs' 101-loss season. MLBTR's Tim Dierkes has suggested a deal in the four-year, $27MM range could work for both the Cubs and Samardzija, who's under team control through 2015. Despite Samardzija's production and a solid half-season from Matt Garza, Cubs starters struggled to complete innings (922 2/3, 24th in MLB), limit walks (3.1 BB/9, 23rd in MLB) and prevent runs (4.52 ERA, 23rd in MLB) this past season. Hoyer will be in the market for starting pitching, and could consider trades or free agent signings. The Cubs will presumably look for certainty given the state of their current rotation, so starters like Joe Blanton, Gavin Floyd and Jeremy Guthrie could make sense. Shaun Marcum, Dan Haren and Brandon McCarthy have health and performance-related questions, but they could also be intriguing free agent options for Hoyer to pursue if the players' asking prices are reasonable. While it's not yet time for the Cubs to spend aggressively on top MLB free agents, they shouldn't hold back on elite international players (though spending restrictions do apply internationally). Prospects such as 18-year-old right-hander Shohei Otani could be worthwhile targets if Cubs scouts are impressed. The Cubs have already begun leveraging their status as a large market team by spending on international players such as Jorge Soler and they must continue adding talent to the organization in this way to the extent that it's possible under the sport's new collective bargaining agreement. The Cuban market could offer impact players as well, though this year's class doesn't appear to be as deep as the one that produced Soler and Yoenis Cespedes. Garza, a midseason trade candidate this past summer, figures to stay put after missing the end of the 2012 season with an elbow injury. He'd likely have more value if he can prove he's healthy, so the timing isn't ideal for an offseason trade. If Garza's healthy midway through the 2013 season, the Cubs should trade him for the best controllable players they can get. Cubs relievers performed less effectively than the team's starters this year, walking more than one batter per two innings (4.8 BB/9, 30th in MLB), generating few strikeouts (7.4 K/9, 29th in MLB) and posting a 4.49 ERA (27th in MLB). While it wouldn't make sense for the Cubs to spend aggressively on top free agent relievers such as Rafael Soriano, they must devote resources and attention to their relief corps this offseason. Trade candidates, minor league free agents and non-tendered players should all be on the team's radar. Perhaps the Cubs can even find a taker for Carlos Marmol, who will earn $9.8MM in 2013 after walking nearly one batter per inning this past season. The Cubs lost 100 games for the first time since 1966 this past season. Even for a franchise that’s grown accustomed to losses that’s a lot of defeats. But they can be closer to contention within a few months if the front office completes a successful offseason by seeking pitching depth and pursuing impact talent whenever possible. I think Marcum and Haren are the free agents the Cubs need to go after. They don’t figure to get long contracts because of their injury history. Dan Harens injury history consists of what? One player not mentioned is Arodys Vizcaíno. I think he could be a big plus if he comes in healthy in Spring Training. I would guess that the Cubs would bring him along a little slowly, using him in relief, but eventually he could be a starter in 2013. I like the idea of going after Marcum, and I would even throw it out there to see if Dempster would come back. The money should be there for Demp. Kevin Youkilis could be a usable stop gap at 3B if the price is right and the FO and Youk should know each other pretty well. I would also talk with the DBacks about Justin Upton. Again, if the price is too high, walk away. Ryan Ludwick could also be an option if available in FA. Justin Upton has the Cubs on his “no-trade” list. I don’t see that happening. I think that’s more for contract negotiations than because he doesn’t want to play for the Cubs. Players put teams with deep pockets on their no-trade list so if they get traded their, they can get some more dough out of them. Regardless, I don’t see him coming to Chicago. I kind of intrigued by Gavin Floyd if you can get him at a good price. He’s still relatively young, has a good GB rate (Wrigley-beneficial), pitched in a HR friendly ballpark in US Cellular, & can benefit with a move to the NL. He’s also on record on wanting to stay in Chicago. Perhaps on a different team? That’s of course if the White Sox decline his $9.5mm option, which I can see them deciling. I wouldn’t expect any major free agent additions. More of the DeJesus and Maholm type veterans will come and go on 1-2 year contracts until they are ready to make a run. They’ve been pretty open about their desire to keep payroll low while rebuilding. I don’t think the Cubs should go out looking for a catcher. Welington Castillo looks to me like he can be an everyday player, so they might as well spend those resources elsewhere. I’d personally like to see Henry Blanco as our backup again, if his option is declined. I enjoyed watching him with the Cubs a few years back. He’s on the downside of his career and would definitely bring that veteran experience into the clubhouse. Maybe David Ross? He could definitely fill the backup role and could provide some power off the bench. I can see them signing a veteran backstop to mentor Wellington Castillo. They need to fill that hole at 3B. I don’t want to see them playing musical chairs for the next 25 year at that position. Not much in terms of FAs that will fill that hole. They have several solid potential 3B prospects coming up through the system including Lake, Baez and Villi. If Youk becomes available they should go after him for something along the lines of a two year contract with an option. Valbuena should not be the opening day 3B, hes not even offensively gifted enough for 2B let alone 3B. I like the Youk idea, give Houston a call as well on Jed Lowrie, Chris Johnson in ARI will probably be non-tendered, and if you want to go big give San Diego a call on Headley. Hoyer has connections there and if you start a deal with Vitters and Baez (Baez seems like a surplus with Castro under contract till 2019) and go from there i could see something happening. You could sign Headley to something along the lines of what Wright signed for his first big contract, maybe 5yr/$55m with an option at the end. Headley will get more than 11 mil a year. Yanks would offer way more than that alone. I disagree. Baez has been nothing but a STUD in the minor leagues so far. He’s still young and could definitely transition to 3B. If Castro fills out, he could transition to 3B, yet I see this as unlikely. There is no way the Cubs sign Headley, since they have gone on record saying they want to build from within, and spend money when the team is ready to compete. Do the Cubs try and re-sign Shawn Camp? 2 issues with this article. 1) having Valbuena doesn’t exactly make us “set” at third base. They need a third baseman until Vitters declares whether he’s a keeper or not, and if not then they they decide whether to eventually plan on Castro, Baez, Lake or the kid they got over the summer – Villanueva(?) at third. I would go for Youk – 1 yr plus an option. 2) listening to Theo it doesn’t sound like he thinks catcher is a pressing need right now – he felt Castillo made huge strides in the last 6 weeks, and certainly made noises like Castillo is the man for 2013. Yeah..this is not going to happen.